Horticulturists are agricultural scientists dedicated to finding better ways to grow, harvest, store, process and ship fruits, vegetables and ornamental plants. They study and use the disciplines of plant propagation and cultivation; crop production; plant breeding and engineering; biochemistry of plants; and plant physiology. Horticulturists work to upgrade crop yield, quality, nutritional value and plant’s resistance to diseases, insects and environmental stresses. The study of horticulture includes eight areas that are grouped into two broad sections – the ornamentals and the edibles. A career in horticulture can encompass many things: producing and selling plants for either food or decoration; genetic engineering; landscape design; selling plants and advising customers in nurseries; tending to plants in parks and gardens. >> WHAT QUALIFICATIONS DO I NEED? >> WHERE CAN I STUDY? >> WHERE CAN I GET MORE INFO? >> WHAT SUBJECTS DO I NEED? Why did you choose this profession? I love the natural environment and making a meaningful contribution to its conservation. What training did you undergo? I completed a National Diploma in Horticulture. Is there a type of personality best suited to be a horticulturist? Horticulture best suits a person who enjoys the outdoors, and who seeks a balance between that and office work. In your line of work, is experience as important as formal training? I believe that they are both equally important and have their place in this profession. Describe a typical day at work I do about two hours office work, four hours working in the garden and nursery, and two hours working with students and the general public. What do you enjoy the most about your job? I like working with plants and people. I also really enjoy the field trips. Which aspects of your work are you least enthusiastic about? Administration! 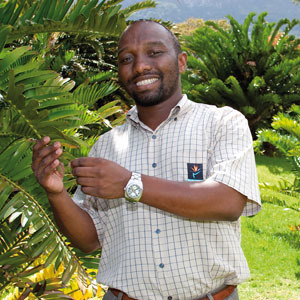 Share a career highlight with us One was improving the seed viability of a Critically Endangered cycad, Encephalartos latifrons. What are your goals for the future? I want to share my knowledge and inspire young professionals in my field. What advice would you give to young horticulturists? Choose a group of plants to specialise in. Why did you choose this work? Since a very young age I was keen to help out in the garden. I love how nature positively influences our busy lives in the concrete jungle; stopping us in our tracks to take a deep breath, relax and enjoy a bit of surrounding beauty, whether wild or cultivated. What did you study? I completed a three-year National Diploma in Horticulture at the Cape Peninsula University of Technology and have also undergone training in Business Management. What makes a ‘good’ horticulturist? Horticulture is a broad field and can suit outdoor-loving people that like physical work, extending all the way to those that prefer laboratory environments. Various niches accommodate different personalities. Very motivated production and marketing orientated personalities suit commercial wholesale nurseries; people, sales and marketing orientated types suit retail horticulture; design orientated and creative types suit landscape orientated horticulture; design, creative, horticultural research and botanically orientated people suit botanical garden horticulture; service, design and maintenance types suit horticulture practiced in Parks departments; people, policy, reporting and staff orientated in horticultural management. Regardless of where you find yourself, you must be practical, have a love for nature, a passion for plants and be people orientated. Experience versus formal training? No academic training can provide an understanding of key elements within horticulture like practical experience can. Because of the variety of positions available, experience helps you find your niche. Describe your typical day Most of my time revolves around people management. As a horticulturist you spend your time guiding and directing the actions of the staff you supervise. They in turn care for the majority of plants and gardens. More specialist aspects of the daily routines are left for the expertise of the horticulturist, such as drawing up maintenance plans, special propagation and care of rare plants, garden design and landscaping. Some days you give presentations to the public or garden clubs, and as a botanical horticulturist we also do field work from time to time. What do you enjoy most? I love the diversity horticulture offers. So many things amalgamate and define your job that you are always presented with something interesting and challenging. Advice for newcomers? Explore your potential. Allow your passion to drive you and develop an interest in discovering and, if possible, experiencing most aspects of horticulture. Start by working out your strong points, then you will narrow the field into the discipline of horticulture that suits you best. Be sure you like working with plants! The field of horticulture offers a wide variety of careers, with some jobs that do not require any formal qualification and others requiring a degree. Employers hiring professional horticulturists prefer to hire those with a bachelor’s degree and some experience in horticulture or a closely related agricultural science. There are many institutions offering degrees, courses, apprenticeships or learnerships. A National Senior Certificate that meets the requirements for a diploma or degree course is a prerequisite for some courses. Some nurseries also offer certificate courses in gardening. Once qualified, graduates can register as senior members of the Institute of Parks and Recreation Management of South Africa. WHERE CAN I GET MORE INFO? WHAT SUBJECTS DO I NEED?